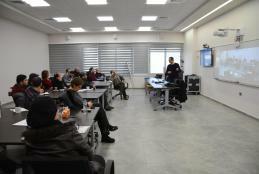 Continuing Education Center at Arab American University graduates its participants from the training course entitled "Advanced Communications" which aims at introduce communication systems and connecting these systems through fiber optic cables and microwave devices, as well as the international connection systems in Palestine (DWDM). The graduation ceremony was attended by Dr. Khalid Attiah, Director of the Continuing Education Center, Dean of Faculty of Engineering and Information Technology Dr. Mohammad Hamarsheh, Head of Communications at the Faculty of Engineering and Information Technology, Mr. Mahdi Barhoush, faculty members, and the course's trainer Eng. Fadi Sarhad. 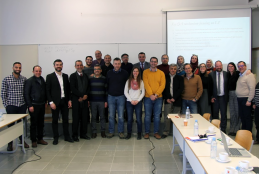 A delegation from the University participated in a training course organized by Ljubljana University in Slovenia entitled "Governance Practices in Palestinian Higher Education Institutions", funded by the European Union, in the presence of a number of Palestinian, European and American universities. The delegation included the Vice President for Planning and Quality Dr. 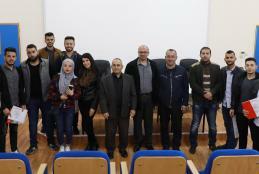 Mouth Sabha, and his office manager Nadia Zeidan, the director of Quality Department Ms. Mays Awwad, and Mr. Sami Awad from Faculty of Engineering and Information Technology.